CPO have really enhanced the world of operetta lovers with their series of rare works by the master. This is the fifth issue that has been allotted me for review. In Die blaue Mazur Lehár really turned things upside down by opening the proceedings with the loving couple being married and the man then realising that this life wasn’t meant for him. In the end everything is sorted out – in some of his later operettas it isn’t. Formally it is a bit of a departure with the central conflict presented in the first act. Then comes the second part where the hero is absent apart from in a dream sequence. In the third act all the problems are resolved. Is it a work worth anyone’s consideration? I’m sure it is. This was one of Lehár’s first successes after WW1. It was a hit in many theatres around Europe at the time but never won a place in the standard operetta repertoire. This seems to be its first complete recording. CPO have recorded a number of other rarities of which I have reviewed Schön ist die Welt (see review), Eva (see review) and Zigeunerliebe (see review) during the last few years. Die blaue Mazur may not be the forgotten masterpiece every operetta lover is waiting for but it still has a lot to offer. I have written at length about Lehár’s rich orchestral language in earlier reviews. It is related to Richard Strauss and Puccini and points forward to that of Korngold which is especially apparent in the waltz of the second act finale. The rather daring impressionist harmonies, delicately arranged with celesta in the orchestral fabric, are certainly ahead of its time in operetta terms. It should also be noted that all three acts have extended finales, the one in act I having more than twenty minutes of continuous music. It may not be his most subtle score but he treats us to some really fine melodies and besides some ravishing waltzes there is in this ‘Polish’ operetta also a mazurka in the last act. The title of the operetta, Die blaue Mazur may need an explanation. ‘Mazur’ is short for mazurka, but why blue? The libretto gives the clue. It is the last mazurka which is danced at dawn when the sky is blue and a Pole only dances this mazurka with ‘the woman whom he wants to claim as his own’. Frank Beermann, who also conducted Zigeunerliebe in this series, seems to have good affinity with Lehár’s music, and chorus and orchestra are on their toes. The recording is, unfortunately, a bit of a problem. The spoken dialogue, of which there is quite a lot, is so feebly recorded that I had to turn up the volume control from my normal setting 14 to something like 23-24 to be able to hear it properly. This also implied that as soon as the music started I had to quickly turn it down to 14. I failed a couple of times, resulting in my wife coming dashing down from upstairs, wondering if I was going to blow up the house. I suppose the producer wanted the voices to be equally balanced during song as well as speech. The other option is to balance the voices closer during the dialogue but this gives an unnatural feeling of the singers running back and forth. Since domestic listening is a bit unnatural anyway I still prefer that option. It’s like zooming in on faces during intimate conversation in any movie or TV-series. The problem is presumably less marked in a larger listening venue. Whether speaking or singing the main soloists on this recording are excellent. I have praised tenor Jan Kobow on several occasions before, as a Lieder singer and also as a fine oratorio practitioner in Haydn’s Die Schöpfung. Here he amply demonstrates that he is also a force to reckon with in operetta: light, flexible, unforced and beautiful singing and a fine sense of humour. Julia Bauer complements him well with her warm soubrette voice and lively acting. The leading couple, Blanka and Juljan, are well contrasted to Bauer/Kobow and offer some really glorious singing. Johanna Stojkovich has a powerful vibrant voice and sings with great intensity and Johan Weigel sports a truly beautiful tenor voice with ringing top. Hans Christoph Begemann’s warm lyric baritone is a pleasure to listen to in the role of Clemens Freiherr von Reiger. 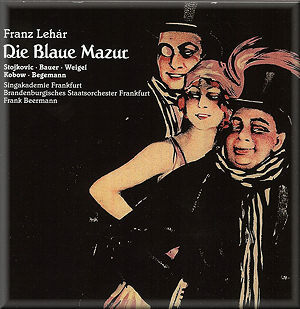 CPO must be praised for their enterprising exploration of the lesser known Lehár operettas and this recording of Die blaue Mazur is a worthy addition to the catalogue with some really outstanding singing.